This Tony Bennett portrait was created with different shades of grays; Blue Grey, Purple Grey, Brown Grey, Red Grey, White, Off-White and Cream pastels. 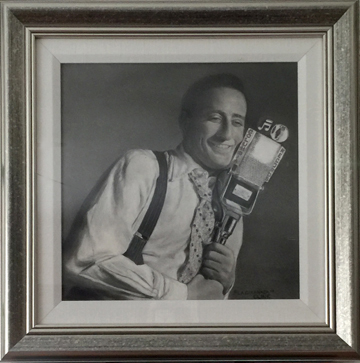 Even though the overall color scheme is monotone, great care was taken to include many shades of gray to portray this beloved and legendary entertainer in a nostolgic setting. The details such as the microphone the suspenders, his young face swooning as he say his song bring you back to those nostalgic days. 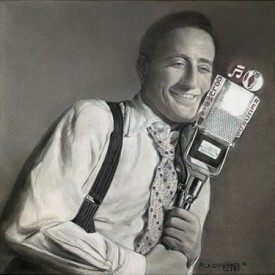 This depiction of a young and dapper Tony Bennett portrait shows him at the beginning of his career at Columbia Records. Now over 90 he is still going strong! Great gift for any music lover whose idol is the legendary Tony Bennett. It is framed beautifully in a solid wooden silver tone frame with a linen liner. The framed original painting measures 29 1/2″ X 29 1/2″. If you have any questions about this painting call or email me directly.